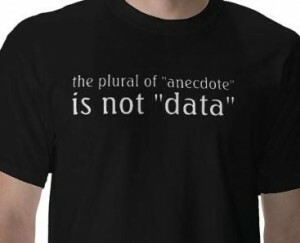 Ever argued with someone who keeps using anecdotes to prove her point? You say, “Yes, but the research shows…” and she says, “But my friend’s sister…” and you never meet in the middle (unless somebody throws a punch). This behaviour is based on something named the “availability heuristic” or “availability error”, which applies to all of us: we predict the likelihood of an event based on how easy it is to think of an example. Arguing by anecdote just means using the availability heuristic out loud. For example, right now it’s much easier to think of reports of earthquake-related deaths than lightning-related deaths and many people will assume that earthquakes are more deadly. However, in North America you’re actually twice as likely to die from a lightning strike as from an earthquake. A number of psychology experiments have shown that we make decisions and estimates based on what comes to mind first. A 1977 study asked participants to briefly remember a list of words that included four descriptive words, then to read a short story and evaluate the personality of the main character. Although the participants knew that their list of words had nothing to do with the story – and they could only remember half those words after the study – those who had read positive descriptive words (such as “adventurous” and “persistent”) had a much better opinion of the character than did participants who had read negative words (such as “reckless” and “stubborn”). The positive words were mentally “available” while they were reading the story and coloured how they viewed the character. Another study discovered that merely imagining an event makes us see it as more likely to happen. John Carroll asked people to participate in an “exercise in imagination” before the 1976 American presidential election. He asked one group of participants to imagine that Gerald Ford had won the election and another group to imagine that Jimmy Carter had won. In both cases, he provided realistic details and asked the participants to imagine getting the news and listening to the speeches conceding defeat or celebrating victory. Both groups later viewed their imaginary winner as significantly more likely to win the real election. As clever readers might already have figured out, the availability error is why coming up with many reasons to support something can actually undermine our support for it: if reasons aren’t readily available, we assume they don’t exist. Our tendency to believe in what is most visible is also why screening rates for a disease go up when a famous person is diagnosed with it and why slot machines make much more noise when pouring out coins than when holding on to them. You can, of course, turn this around for your own purposes. If you want your audience to believe in global warming, ask them to picture the long-term results. If you want them to be more aware of the prevalence of mental illness, keep bringing the subject up. It appears that recently presented information is most “available”, but so is anything that produces concrete images, strong emotions and a sense of drama. So, I now expect to see you all out there creating detailed imaginary scenarios for your various audiences. Please try not to let them get too gruesome, though. If your personal mission is to rid the world of poor-quality toilet paper or the horrors of gingivitis, I don’t want to imagine in glorious technicolour what will happen if you fail. That’s just unkind.